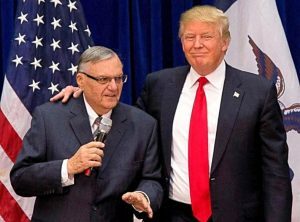 Friday evening, in his first use of the presidential pardoning power, President Donald Trump pardoned convicted racist and self-proclaimed "America'sToughest Sherriff" Joe Arpaio. The former Maricopa County Sheriff, who was a vocal Trump campaign supporter, was convicted on July 31st of criminal contempt for his continued defiance of a 2011 federal district court order to cease his discriminatory immigration enforcement tactics in pursuing undocumented immigrants. The announcement also came as the rest of the country, and every media outlet, was focused on the ongoing devastation to hundreds of thousands of Americans as Hurricane Harvey plowed through Texas and the Gulf Coast. Trump's priority of playing to his core voter base was further underscored earlier Friday by a directive to the military to implement his ban on transgender people. As with other announcements, Trump's pardon of Arpaio reportedly came as a surprise to White House staff and the Department of Justice (DOJ), which oversees the legal and normally lengthy official process. Presidential Pardon: Article II, Section 2, Clause 1 of the Constitution states "The President ... shall have Power to grant Reprieves and Pardons for Offences against the United States, except in Cases of Impeachment." It was the latest in what seems like a deliberately self-destructive path paved by the President's own actions. Trump recently pursued legal opinions on the scope of the presidential pardoning power and his ability to pardon family members, aides and himself. How does the Pardon Process normally work? An individual convicted of a federal crime may apply for a pardon to the office of the DOJ's Pardon Attorney, which assists the president in exercising his pardon power. The president's power can only be used to pardon someone for a federal crime -- civil and state pardons are issued by governors. Applicants are not usually considered eligable until five years after their conviction or their release from prison. The pardon office makes a determination and forwards its recommendation to the deputy attorney general for his or her recommendation, which is then forwarded to the White House for a decision. In Arpaio's case, however, no application was ever submitted to the Pardon Attorney, and the pardon was granted before Arpaio, who was facing up to six months in jail, even reached his October 5th sentencing date. 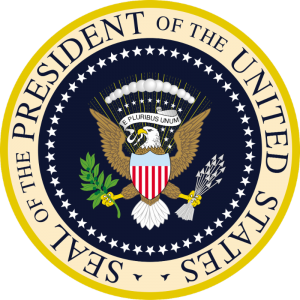 It is highly unusual for the presidential pardon to be used for a misdemeanor offense. Trump's first pardon also comes much earlier than his predecessors - Barack Obama and George W. Bush's were a year into their first terms, and Bill Clinton waited almost two years. According to DOJ, as of August 7th, Trump had 376 pending requests for pardons and 1,508 requests for commutation or sentence reductions. Share this to Sign-Up for the Daily updates!